This winter, my mother added two new lights to the barn's main room. This shop light was picked up at a yard sale. The wires are threaded through a galvanized pipe. 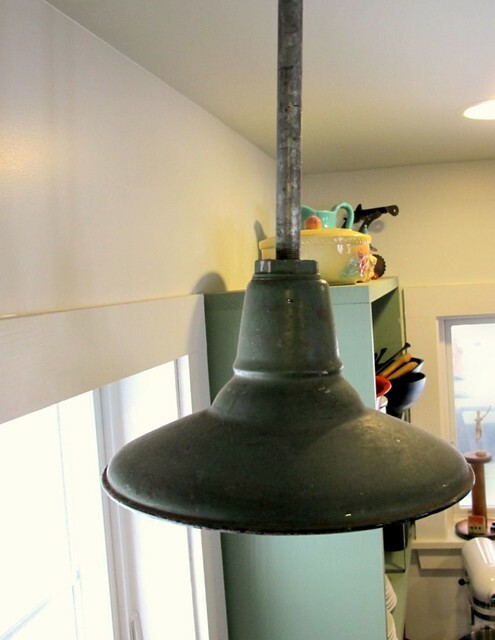 It hangs high above the kitchen sink, so it was hard to get a good shot from the floor. I stood on the counter so you could get a glimpse of its patina. Galvanized pipes and flanges hold the shelf, keeping the hardware in the room consistent, while doing their job with strength and honesty. Hey- there's the other new light! My mother had originally gotten the light to hang outside. It didn't attach well to the chosen spot, and sat in the shed dejected for two years. I think its new home is just right, don't you? 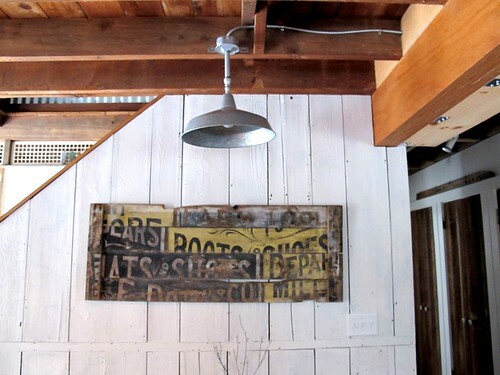 Exterior (industrial) lighting works very well in the inside of a barn/home. 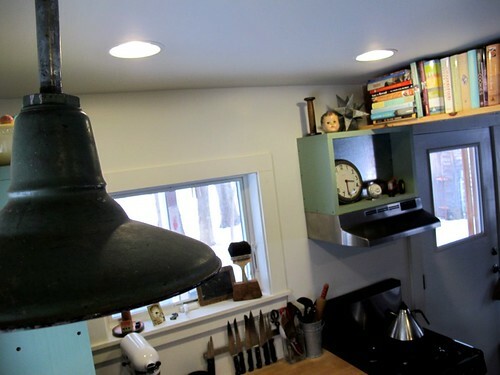 I might have to go sit under that light with a stack of my mom's cookbooks... and plan some delicious meals to get us through the rest of this snowy winter. I'll let you know if I come up with some winners. I was quite thrilled with how many of you made last week's lentil miso soup! It's the simple things... it really is. i love that you shared this, this is one of my favorite ideas in your mother's home and given her amazing space-that is saying a lot. happy day to you! hope it is sunny there and not as blustery as it is here...we do have the sunshine though. Hey, branchhomestead- not quite sunshine... but bright. Thanks for the feedback... especially since you've seen the beam shelf in person! 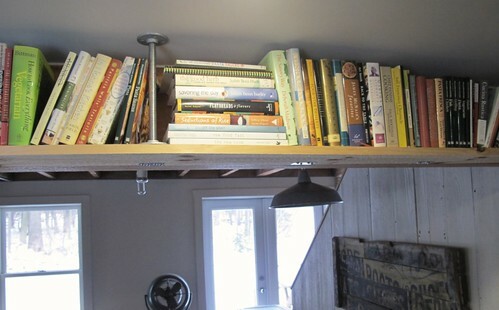 I love the beam bookshelf - we have a lot of books (I will never say we have too many) and it's sometimes a challenge figuring out where to put them - I once built a bed frame with bookshelves underneath that were hidden by the bedskirt. 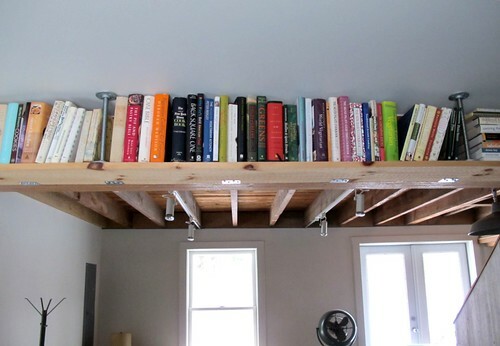 Taking the books up to the ceiling tho - that's a pretty neat idea! I've been thinking about this- taking a shelf up to the rafters. We have books coming out of our ears and we're running out of space. But there is space- and I like that I can see it here first! i love the barn and what a fantastic job ya'll have done with it! lots of fun seeing it. Everything is in perfect shape and position! Love those lamps! All I can think of is...GOOD THING THERE ARE NO EARTHQUAKES THERE! Right? I love it though,the look, the practicality of it. Just perfect for that lovely farmhouse of your mom's.